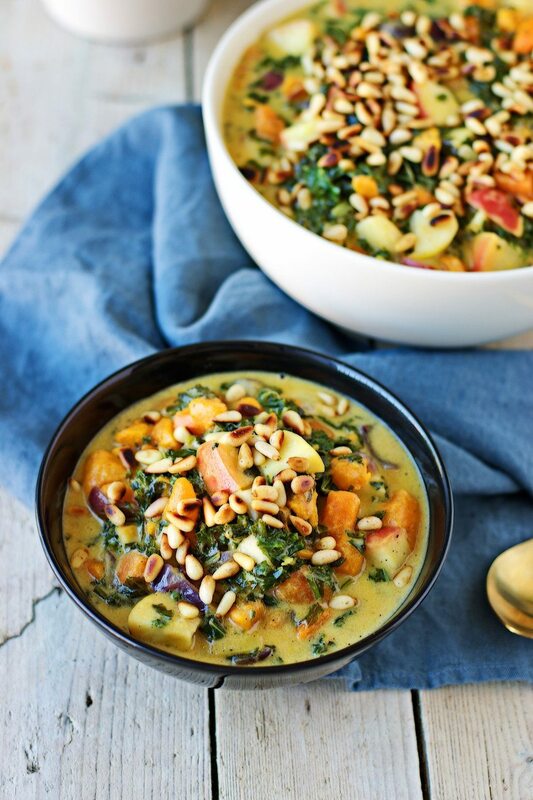 Of all sweet potato recipes, my new Vegan Sweet Potato Soup with Kale is not only easy to make but it also combines the richness of a potato soup with the healthy boost of a kale soup. Trust me, there is nothing better than my Vegan Sweet Potato Soup with Kale for a gloomy fall day! When the days get shorter and colder, I often long for a hot soup to warm me up. I know that it works like this for many other people as well. Especially in fall, people seem to crave, for example, creamy potato soups even more than the rest of the year. This time, it is no different and I was thinking about how I could give myself an amazing vegan treat in that situation. Because I’m such a fan, I’d rather have a sweet potato soup than using normal potatoes. Checking among my sweet potato recipes, I realized that I already did have a Coconut-Mango Stew with sweet potatoes – but somehow that didn’t have the right fall spirit that I was looking for. It’s an amazing summer dish, though. Why not a Vegan Sweet Potato Soup? What would I need to add to sweet potato dishes so that I got the fall note I was looking for? One thing that is always a winner for me is adding apples. And then – some of you might have read my kale recipes here and here – I’ve started to get very fond of kale in pestos or in a casserole. Here, however, I wanted to go more into the direction of a kale soup or stew and combine the richness of a potato soup recipe with the health boost coming from the kale soup. So this is how my Vegan Sweet Potato Soup with Kale was born: I briefly cooked diced sweet potato in coconut milk, added apples, kale, onion and let it cook a bit more. The beauty of this recipe is that it is not only tasty and healthy but also super easy to make. As a fine extra, I sprinkled the finished soup with roasted pine nuts. What a flavor bomb! Start out with preparing the ingredients. Peel and dice the sweet potatoes. Wash and chop the kale, anion, and apples. Bring the coconut milk to a boil in a large saucepan. Add the sweet potato dices and cook on medium heat for about 5 minutes. 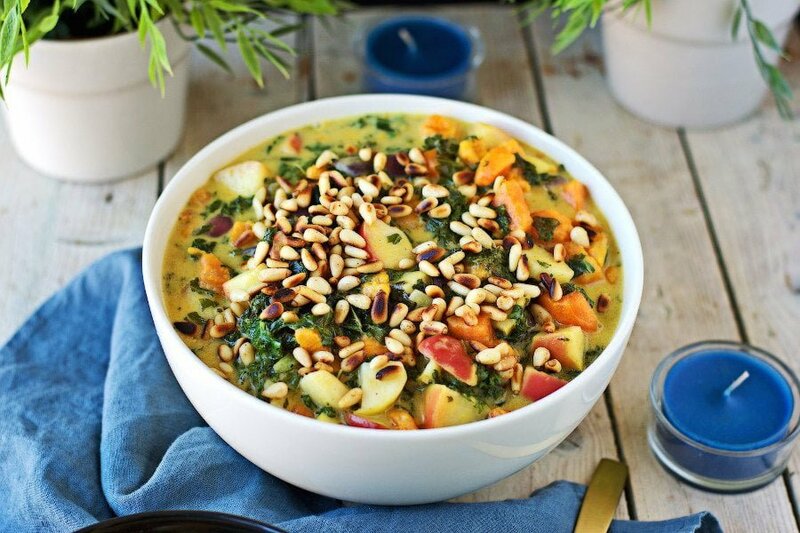 Serve the stew hot with a good amount of the roasted pine nuts. Yum!! Two of my favorite ingredients – kale and sweet potatoes. I tend to fall back on butternut squash for soups but this reminds me that I need to remember the sweet potato! Love this. This looks and sounds incredible! I actually have a Sweet Potato Almond Soup simmering away on the stove as we speak! But I love the apple and coconut milk in your dish. Must try this one next! And I am one of those that loves soup all year, but when the cooler temps come blowing in, it’s ALL I want to eat! this is my kind of soup, a few ingredients, quick and easy-to-make, healthy and contains sweet potatoes!!! YUM! 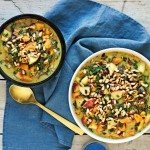 Yum, I love sweet potatoes and kale, they sound wonderful together in this soup, perfect for a cozy fall dinner! This looks delicious! The full fat coconut milk is the key! 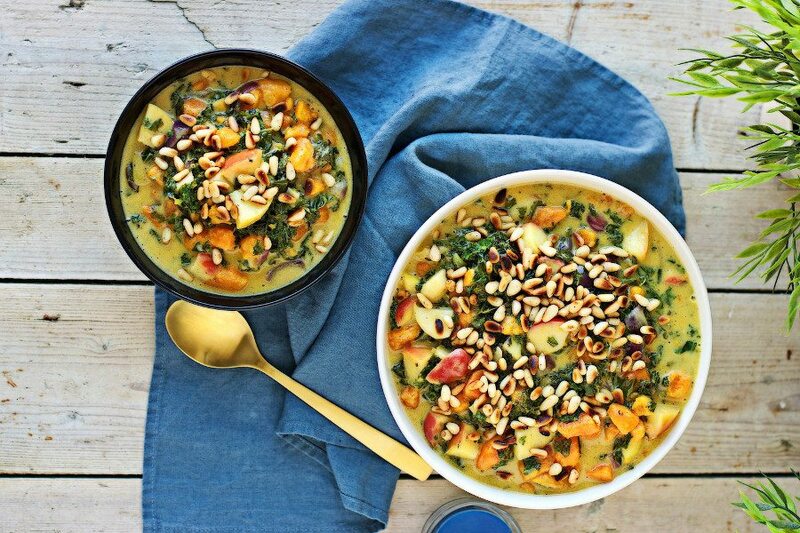 I could live on this soup–looks fabulous and may just be what I make for lunch today! The flavor in that little bowl looks outrageous! I love sweet potatoes and I love kale! This looks gorgeous Florian! Love all the colors. I make a sweet potato and kale chickpea soup this time of year and the combo is amazing, so I love that you added those 2 ingredients. Kale is so much more mild in soups and really delicious. I bet this is incredibly filling with all that coconut milk! Beautiful! Love the sweet potato used as the base of this soup. I love all the amazing textures in this gorgeous bowl of soup! How gorgeous! A lovely soup with some of my favourite veggies! Absolutely delicious, Florain! I am too longing for a hot steaming bowl of this soup! A gorgeous blog with tons of veggie recipes! 🙂 Cheers! I’m making this tonight! How much salt and curry do you recommend as a base? And do you think lite coconut milk will work as well? High fat foods upset my stomach. Love your blog! Hi SP676! I recommend a good pinch salt and to start with 1 Tbs of curry. Then I think the best is to gradually add more to your own taste. And I’m sure it will turn out amazing with lite coconut milk. Let me know what you think. This was amazing! My 7-year old daughter is a very picky eater these days and she LOVED it. I used just under a teaspoon of pink Himalayan sea salt, and I only had about two teaspoons of curry powder left so I just emptied the bottle and it was perfect. Hi SP676! Thanks so much for your amazing feedback. Glad it was such a big hit! Hi Kathy! So happy to hear it was such a big hit! Thanks for your fantastic feedback! Do you know if this soup freezes well or does it mess with the textures of the ingredients? This recipe has become a requested favorite in my house (and one I give to nearly everyone I know who loves to cook). It usually goes so quickly that I haven’t needed to freeze it before. Thank you for the help! Hi Erin! Thanks so much for your fantastic feedback! That makes me really happy! I haven’t tried that before and wouldn’t recommend that. It will affect the taste and texture. I made this tonight and it was perfect for the 40 degree weather that just hit Texas. I was surprised on how quick this came together and wow it was delicious! Instead of pine nuts, I used roasted pumpkin seeds and added about 2 tablespoons of curry powder. Amazing! Thanks so much for your amazing feedback, Kara! I’ll have try with pumpkin seeds next time! I hope you’ll find lots of more recipes to try!